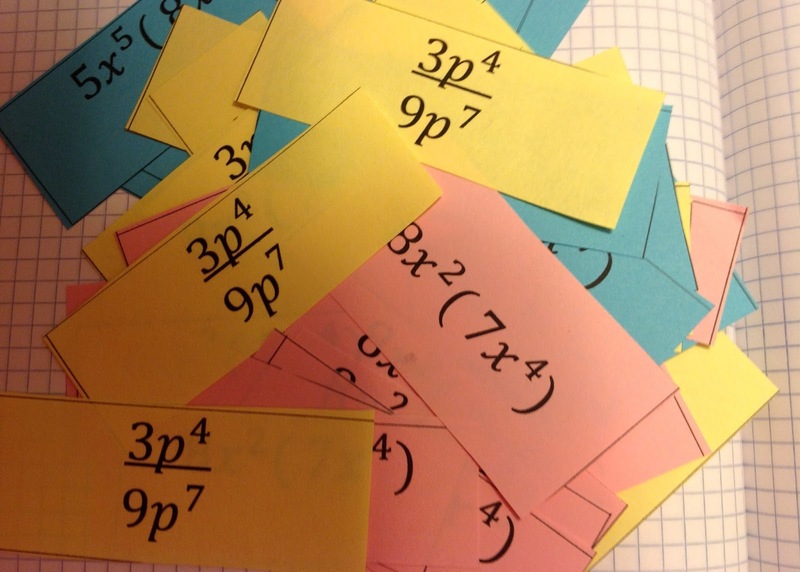 Reflections and sharing of an eighth grade math teacher. Guess what? I'm back for awhile. Those of you who follow me know that I retired a year ago and haven't posted anything since then. Our family has been very busy with a wedding and a graduation. It was so nice to have the time to really enjoy and savor every moment of these very special times with our kids. So just as things were slowing down a bit, a friend of mine that I taught with for many many years called me to say she was going back to teaching after 7 years off. 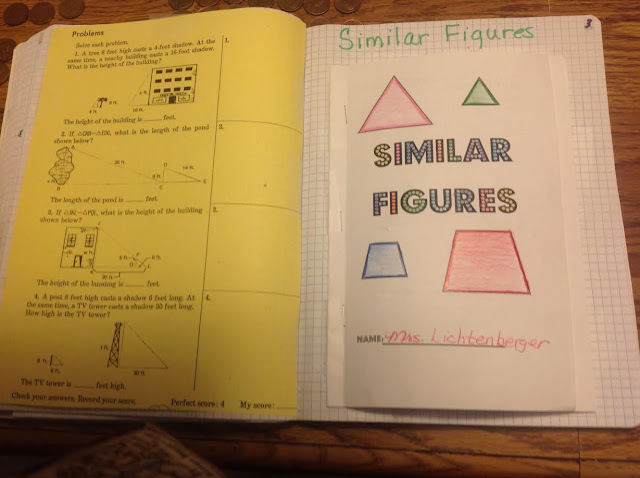 She wanted to use interactive notebooks with her classes but didn't know where to start so I told her I would help her in setting the notebooks and would create some foldables for her as well. 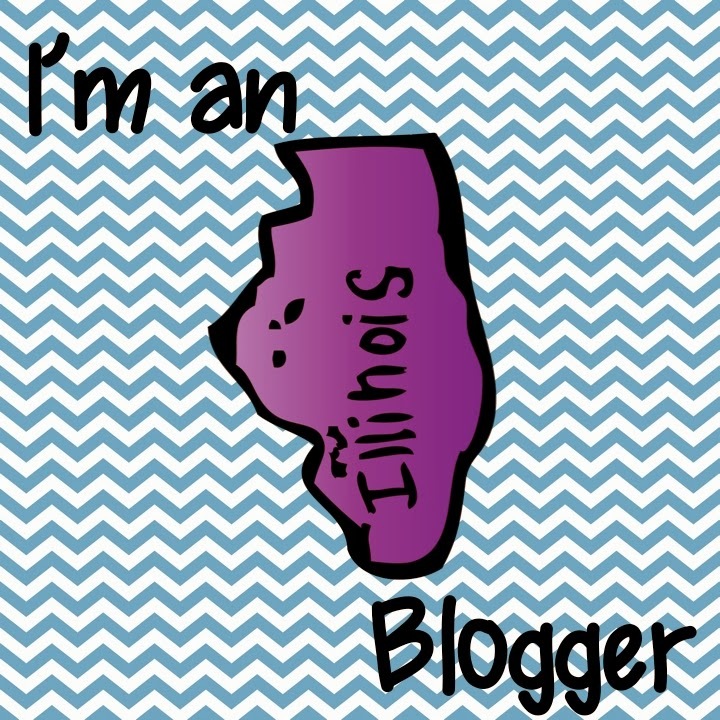 So I decided to start blogging again about what we are doing. I've missed all of you! After deliberating long and hard and with the encouragement of my children I've also decided to start a teachers pay teachers store. When I was working my goal was to give everything away so teachers could use what I had created and it would not get thrown in the garbage. Well I accomplished that and am so happy so many teachers and parents are using my materials. Now my goal is to just pay for my paper and ink I use for printing and I am hoping that many of you will like what I have to sell. With that said, here is the first foldable that I made this year. Check out my store I have one freebie and four other listings. Lots to come I promise. Hi everyone. Well it is official, I actually retired in June. During the summer I didn't feel any different but with the school year beginning last week, it now feels real. I'm looking forward to taking a fall vacation, something I could never do when I was teaching. As much as I wanted to do lots of posts last year it was just too hectic. But now I have the time to clear out the over 60 posts I started that are sitting in my draft box. So I will be coming back from time to time to share them. 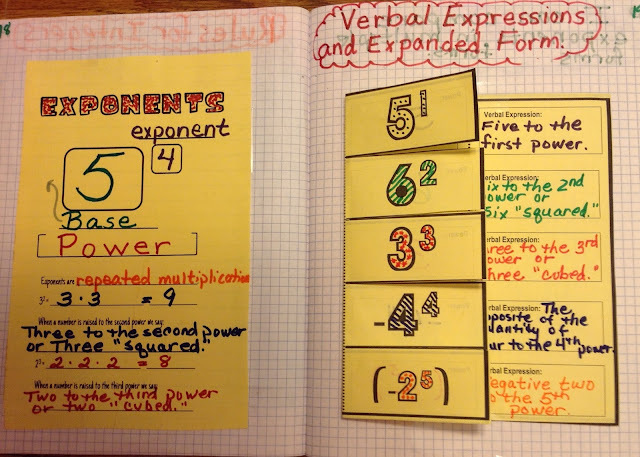 I know the first unit we covered in 8th grade was exponents so here are a couple of interactive notebook pages I made last year. 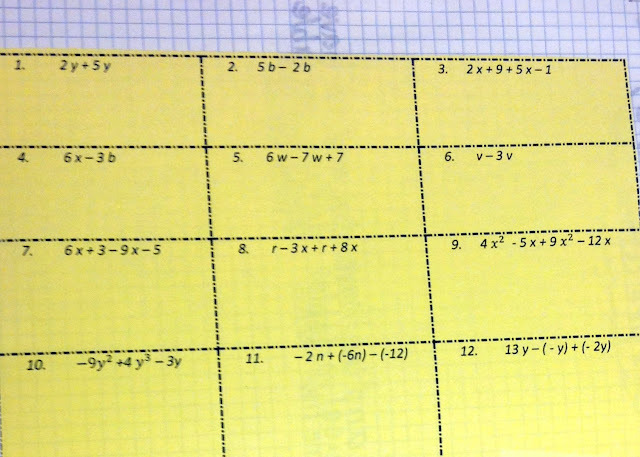 These were used in my 8th grade Pre-Algebra classes. Enjoy! 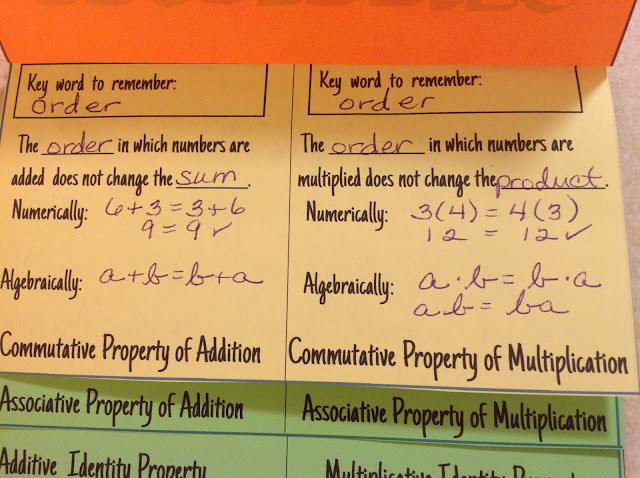 My students enjoy coloring so I used numbers that could be filled in. They loved it! helpful for my second language learners. I like how this foldable turned out. 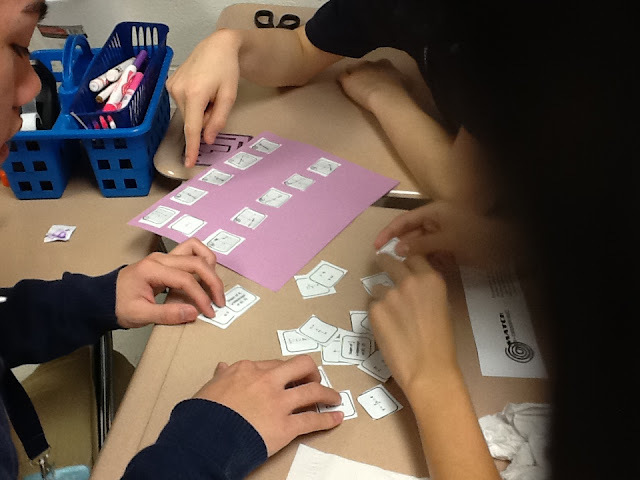 Then the kids reviewed their exponent rules using a Kagan Structure called Rally Coach. I must admit Rally Coach is my favorite Kagan Structure and I used it all the time with my students. 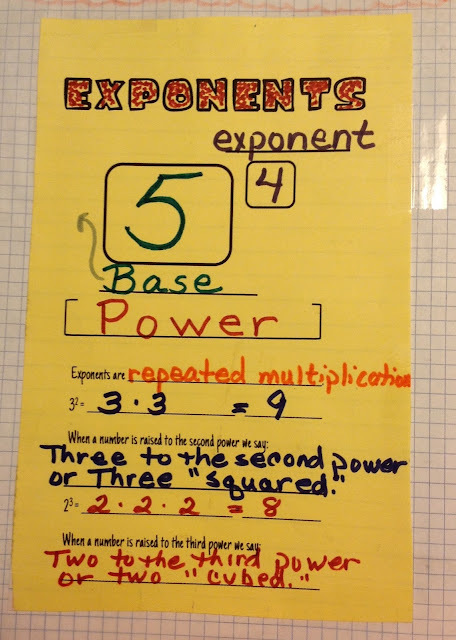 It really gets kids talking about math which helps their understanding so much. See my previous post about Rally Coach HERE. Have an amazing school year everyone! In Algebra we are working on Slope-Intercept Form. I'm trying to flip my two Algebra classes, but it is not as easy as it sounds to do this. My two classes are very different from each other. Actually they are polar opposites! My one class does all of the work I give them with only two students that I need to follow up with. 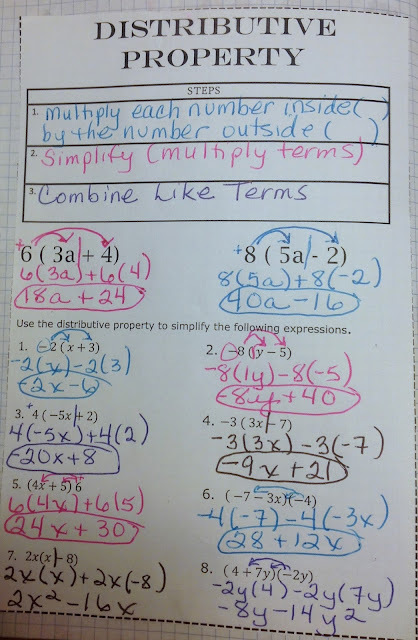 My other Algebra class has about 3/4 of the class that do not do the work required and it is a daily struggle to keep them motivated and up to date on their work. They have been watching videos and completing their notes at home then we are doing activities to reinforce what they learned. 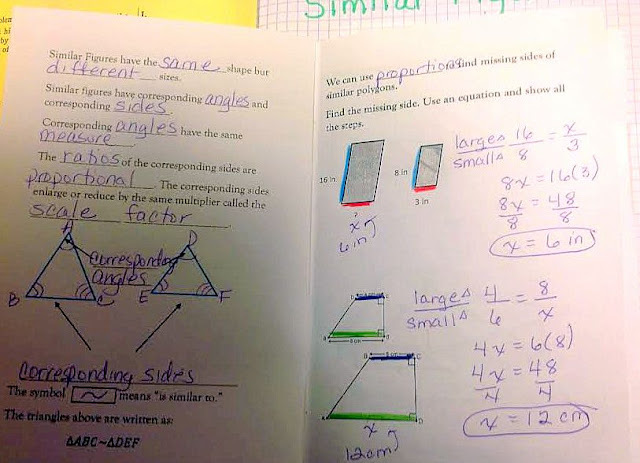 What I am finding is that they may copy the notes but they don't read them for understanding. This is going to be a process but I'm going to continue until the end of the year. It is something that I've always wanted to try, so we will see how it goes. 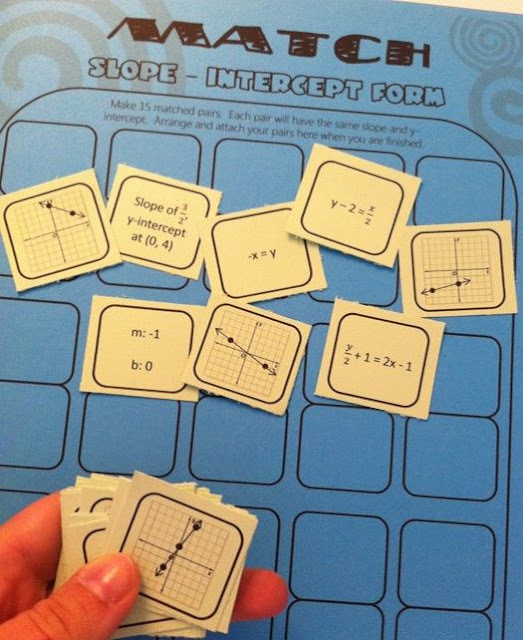 Today we started this slope-intercept matching activity from Math Giraffe at teacherspayteachers.com. How I love teacherspayteachers.com. 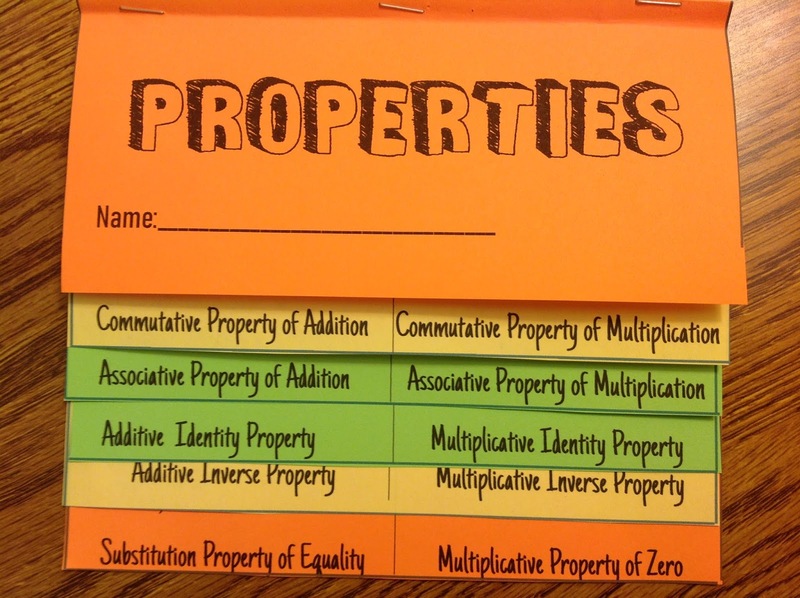 I can make great foldables but not these activities. This one is well worth the price. 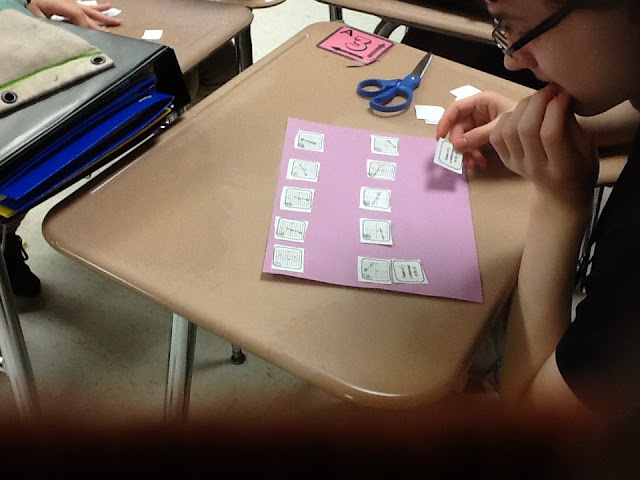 Students match graphs, slope and y-intercepts and equations. The only thing I added to this activity was to number the graphs from 1-10 so they could put the first ten in order to make it easier for grading. Everyone was talking and working hard today and that makes it a good day. I don't know why they will not clear their desks off so they have room to work. Why???? group of three. Great collaboration with this group. I had extra colored paper I needed to use. This is a short quick post but I am trying to stay to my three post per week. So far I'm on track for this week. YES!!! I am having so much fun this quarter and my students are loving this too. I'm hoping that the videos and notes get better. This quarter is flying by. Wow. Last week, in my Pre-Algebra classes we learned about like and unlike terms. We completed this foldable from Sarah at everybody is a genius on combining like terms. All of the foldables on this page require no prep work. 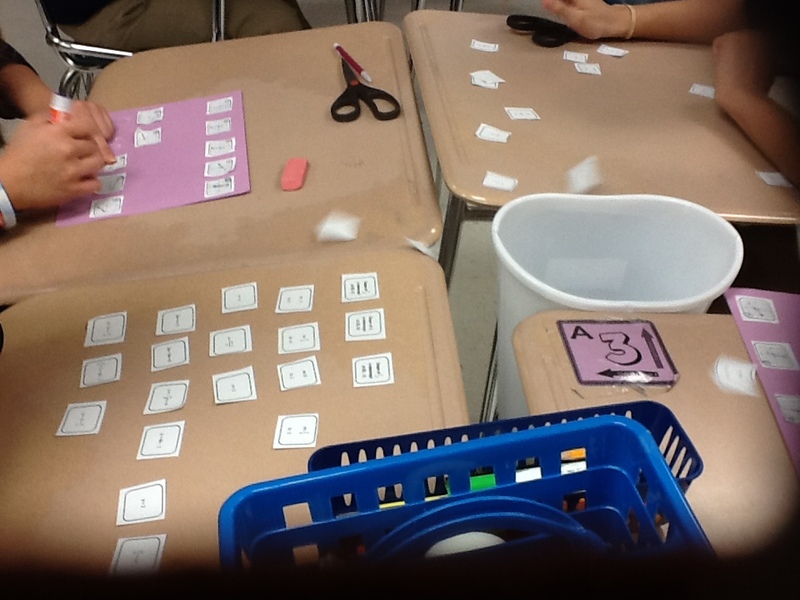 The students do all the cutting, writing and folding. These are pages I have used with my students in the past. I spruced them up a bit to look better. I like how this page turned out. These are matchbook foldables and I love them because they are small and we use up lots of my leftover bits of paper. 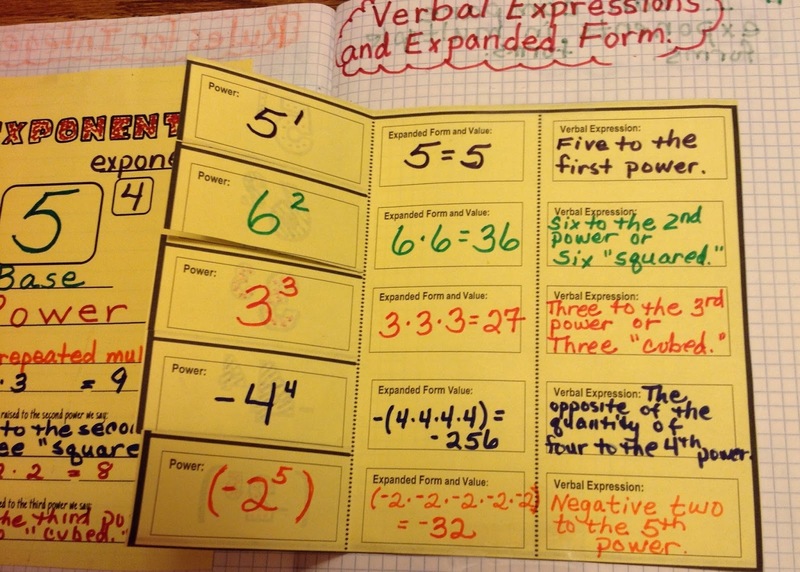 We completed the foldable below from Sarah at everybody is a genius combining like terms. I like how Sarah has the students place lines before all of the + and - signs to separate the terms. 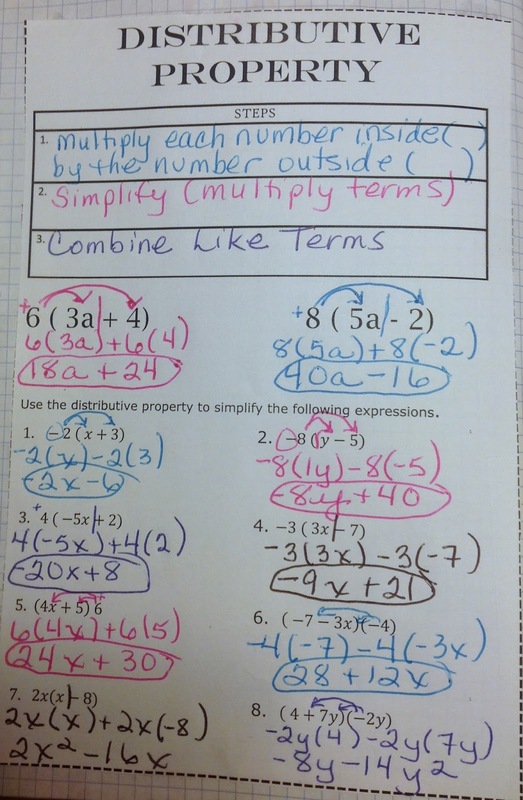 This is such a great visual for my students and really helps my struggling students. 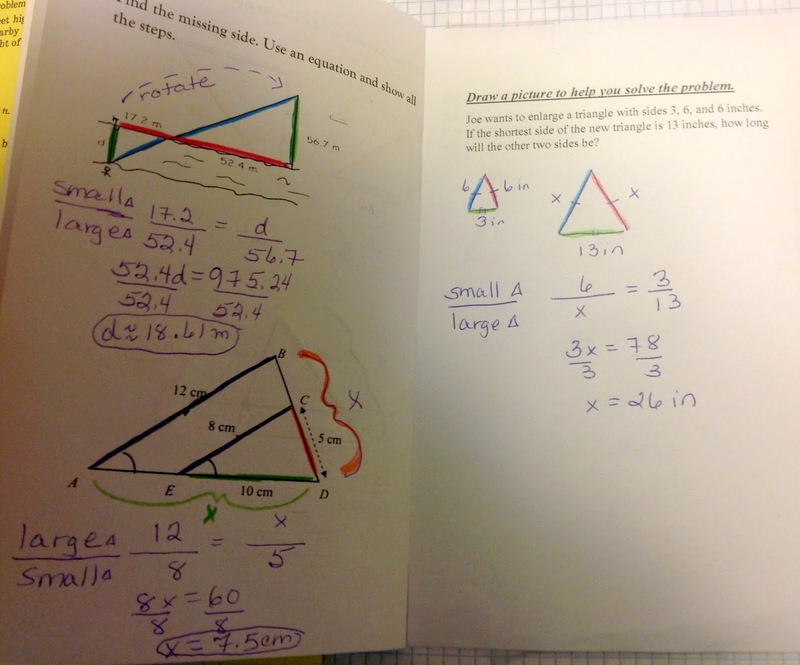 Then we did a work page for the other side of our interactive notebooks. I did this as a guided practice with them. The problems are all a little different so there was lots of review for them over integer rules and like and unlike terms. 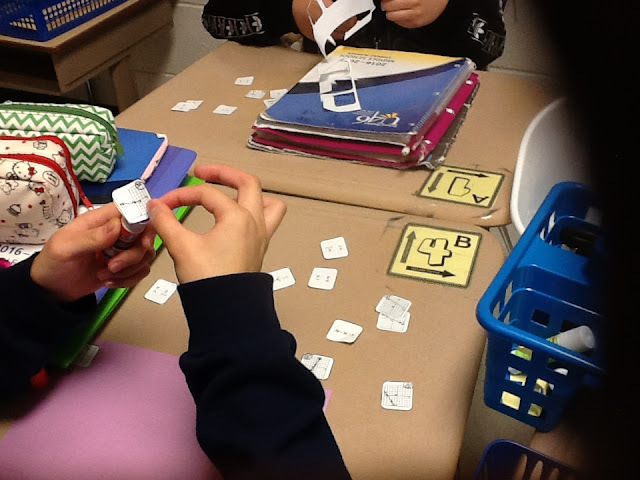 We places the lines in front of all the + and - signs like in the foldable. They understood it! I'm sure you can come up with a better Frayer Model than this. I think I could improve the definition and facts. This page was great. My students always get so mad at me because I MAKE them write down the distributive property the long way and not just using arrows. I find it helps them to make less mistakes on signs when they write it all out. 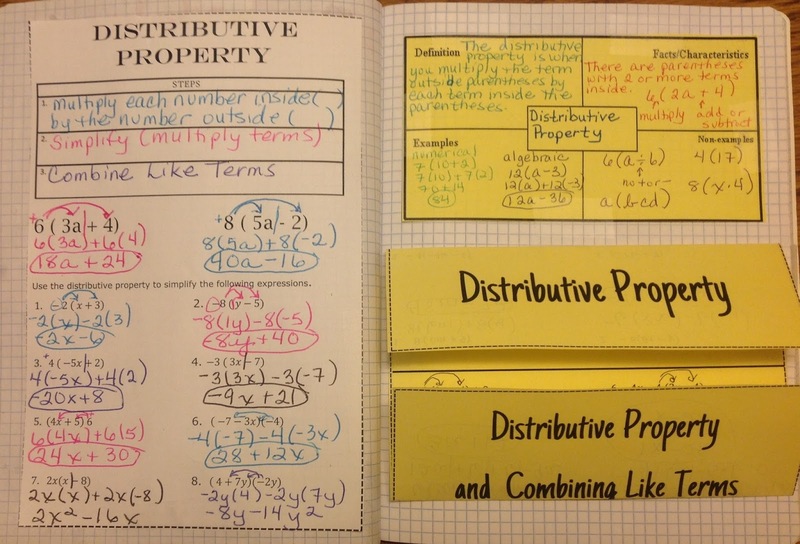 I saw a foldable like this somewhere and I never made one like this before. Of course, I had to make it. It took awhile but finally everything lined up and it turned out great. The problems increase in difficulty as you go and the kids did a great job on this. I'm doing the happy dance because they never can understand the types of problems on the bottom and this year they did! Hope your are enjoying my last semester journey with me. 70 days to go til retirement. I made a goal to write a post everyday until the end of the school year. Well, that lasted for a total of one day. It amazes me that people can do that! I just can't find the time. Now my new more realistic goal is three times a week. They may be short posts or they might be all pictures but I will post them. In 8th grade Pre-Algebra we finished studying Similarity. I'm pleased with how well my students are working on their interactive notebooks. Being able to cut, color, tape and assemble our foldables is such a wonderful sensory activity. It benefits so many of my students who are hands on learners and many of my ADHD kids. Then there are my creative girls who come to class with big smiles and pencil cases full of colored pencils and markers ready to begin class. I provide colored pencils and markers for them but these girls love to add special touches with their supplies. 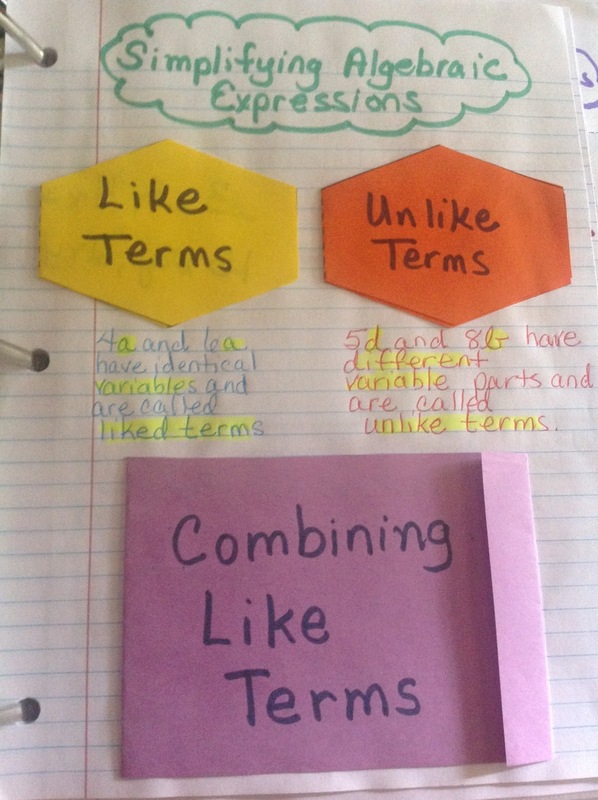 On my foldables I've been adding area that they can color in if they like. This is great for those who can copy quickly as they can color while they wait a minute for some other students to finish copying. 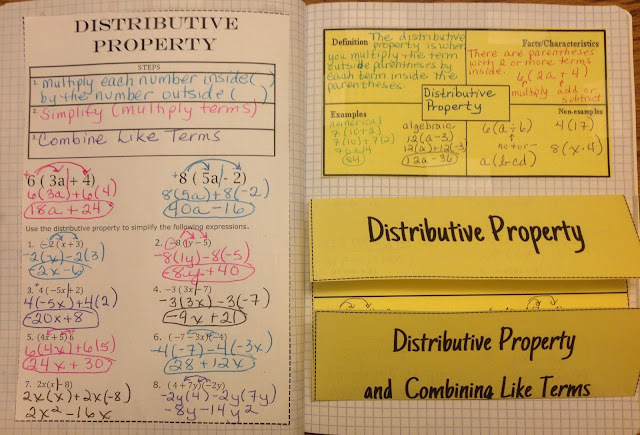 If you haven't tried using foldables as part of your instruction I strongly encourage you to try some. It will take the kids time to get use to cutting quickly but they get much better at this skill as the year goes on. Also adding some fast music in the background helps them to cut and work faster as well. I always put on Twist and Shout, they want rap but I tell them they have to listen to my music. They like it. 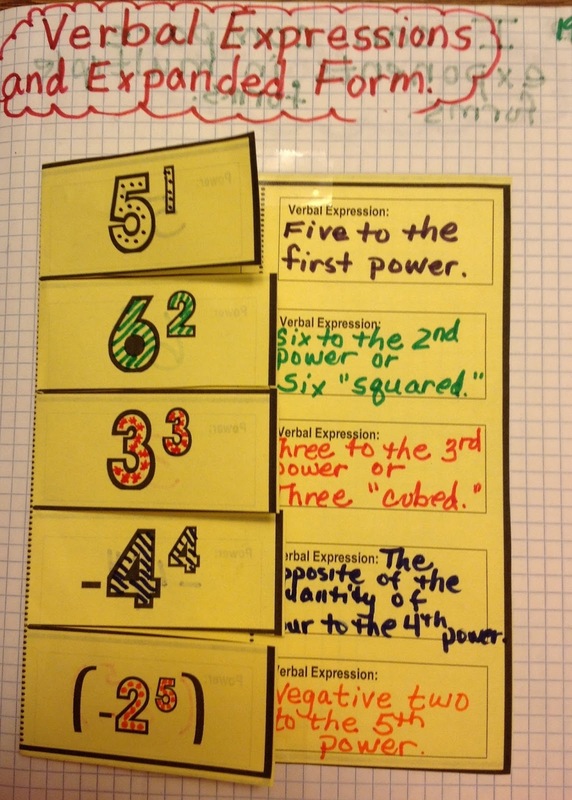 Here is the foldable that we did on Similar Figures. I like how it turned out. 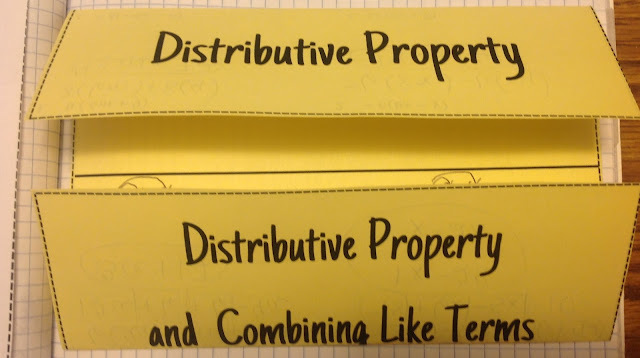 Maybe a few more word problems but we had a work page of word problems that we put next to this foldable. I can't tell you where this work page is from. I've had it forever and love it. Next, we went over some vocabulary and some basic problems. I reviewed proportions with them as well as one step equations. to find the corresponding sides. who struggle with this concept. Then in groups the students did this matching activity that is free at teachers pay teachers by Mrs. Slick. They had fun with this activity. I had each group work with me at the table for a few minutes. I started with my lowest group so I knew that they understood what to do. Then I walked around and watched the fun. I was thrilled to find the resources in the link below from Utah Education Network. 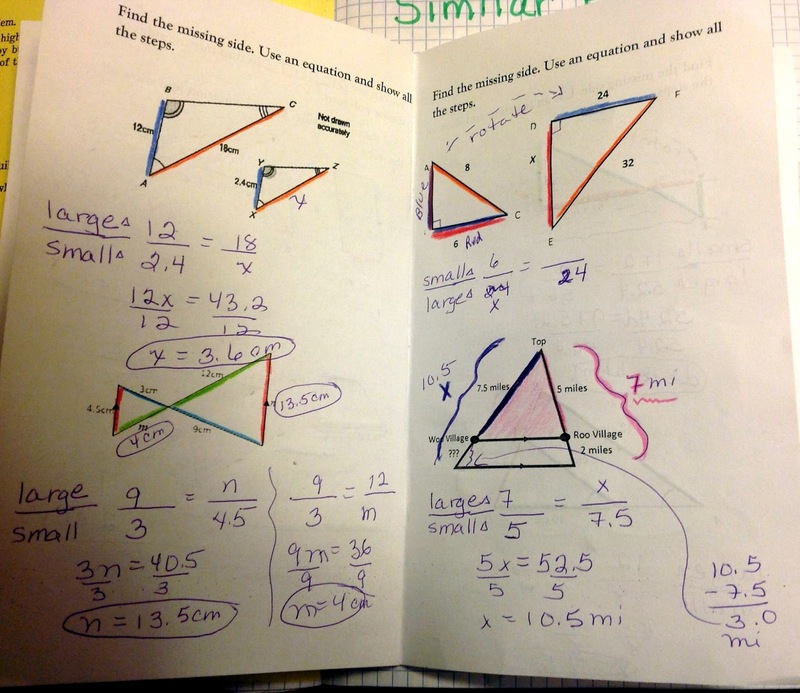 I used the Rally Coach activity on similar triangles from them. See previous post on how to use a rally coach structure in your classroom. Kagan Structures are different from how the Utah site explains it. I thought it would be easy for them, but as they did the activity it became obvious that my kids needed easier problems. I would go back and redo it for the kids I teach. There are lots of great resources at this site. Unfortunately, I didn't have time to use more of them. 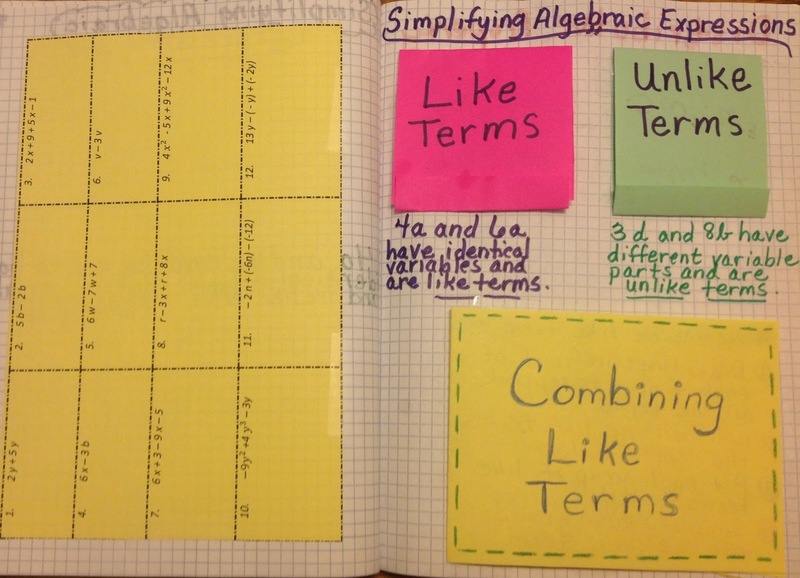 In Pre-Algebra we started like and unlike terms. 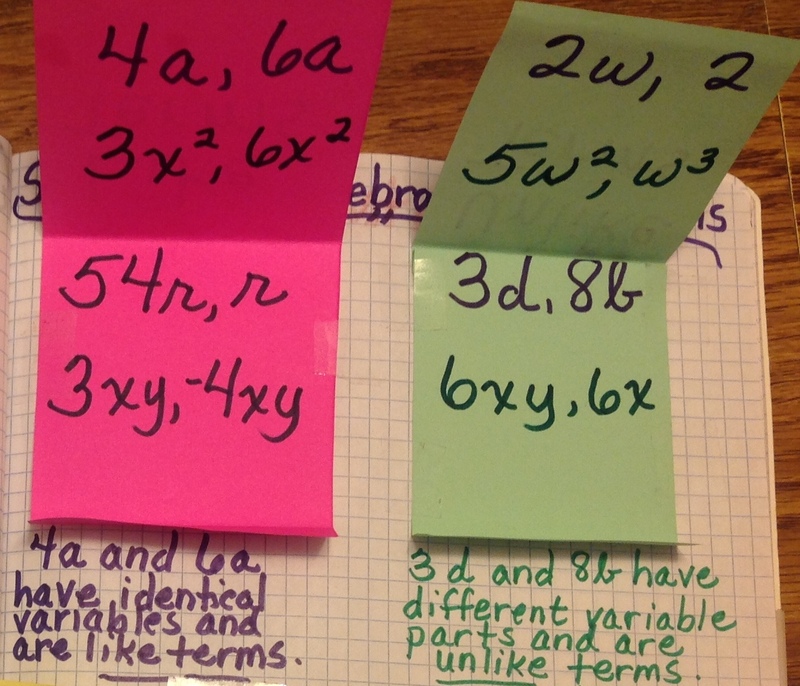 I pulled out my container that has pieces of colored paper that I have saved over the year and we made these foldables. See this post: Like terms, Unlike terms INB pages. After we did the top of the notebook page the students did a Rally Coach activity with this worksheet at teacherspayteachers.com: Race to the top from Kathryn Goodhart at teachers pay teachers. If you are not familiar with the Rally Coach Kagan Structure I will try my best to explain it to you. First of all, the students in our classrooms are in groups of four, sometimes a group of three if there is an odd number of students. They have shoulder partners and face partners for group work. For the Rally Coach structure, students work with their shoulder partners. The explanation given from the teacher is important because social and group expectations are a huge part of Kagan. First, you explain what you want the students to do and the behavioral expectations for the group. Next, you let the kids know what behaviors you don't want to see and lastly model the expected behaviors. One of the partners is given a question that has only one correct answer. That's easy to do in math. There is also only one piece of paper and one pencil for the pair. Partner A solves the problem explaining their reasoning to Partner B. Partner B coaches Partner A if they need help and also affirms the work they are doing correctly. If the answer is not correct, Partner B coaches Partner A to arrive at the correct answer. The students switch roles and repeat the process. Well, we started this but did not finish by the end of the period. That was 1st hour. When my 4th and 8th hour Pre-Algebra class came in half of the classes were absent due to ACCESS testing. I guess I should have read the email sooner, I wouldn't have planned a new lesson for today but, oh well, I will have to catch up with the others tomorrow. 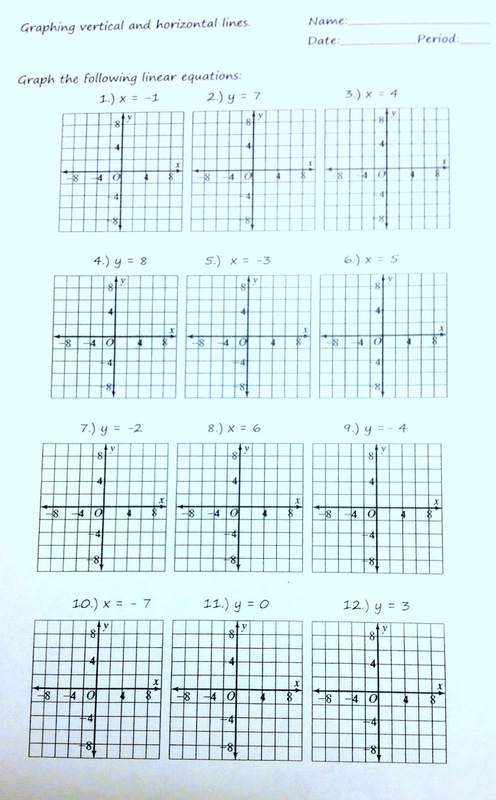 In my Algebra classes I wanted the students to discover how to graph horizontal and vertical lines with their partners. I handed them this sheet and they worked with their partners to graph these. Of course, when they looked at it they had no idea how to graph these. We talked about making a table and listing pairs of points and then graphing them. It took them a while but they started to get it on their own. That makes me smile. After the first few they wanted to know if they still needed to make tables and no they could use the rule they discovered. Tomorrow we will do our HOY and VUX graphic organizer. 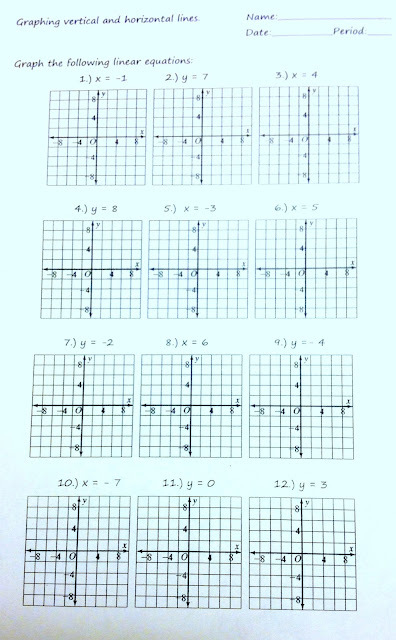 Download the Graphing horizontal and vertical lines here. Well that's it for today. See you tomorrow. Only 77 days to go! The countdown has begun. I have only 77 more teaching days with my students until I retire. I have decided to let you follow me in my last semester and to write a daily post to tell you what we are doing in class. There are so many things I want to do with my students that I have never tried like stations and a flipped classroom. These are the two that I have decided to do for the rest of the year. It's now or never so enjoy the journey with me. I'm also pulling out all of my fun activities I have taught over the years to teach one more time. Please leave suggestions or comments and any resources that you have found helpful that I could use. Here's the plan. On Monday, I am going to talk with all of my classes and let them in on the changes that will be happening. 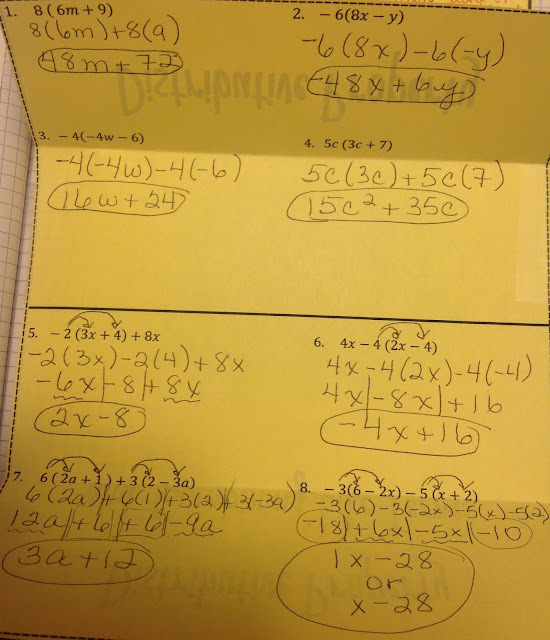 In my two Algebra classes I am going to explain how we are going to flip our class. Many of my students do not have Internet access at home and their phones have limited data, so if they cannot watch the videos at home they can come to my classroom before or after school or eat lunch in my room and watch the videos. I don't have the time or energy to make all these videos so I'm starting with the videos that come with our book or using Khan Academy. In my 3 Pre-Algebra classes we are occasionally going to flip the class but it will be an activity based learning experience and of course lots of foldables. This is going to be a challenge especially with my last period class. However, I am determined that we are going to succeed and I know if it engaging they will love it. I can't wait to get started so sit back and enjoy the ride with me. 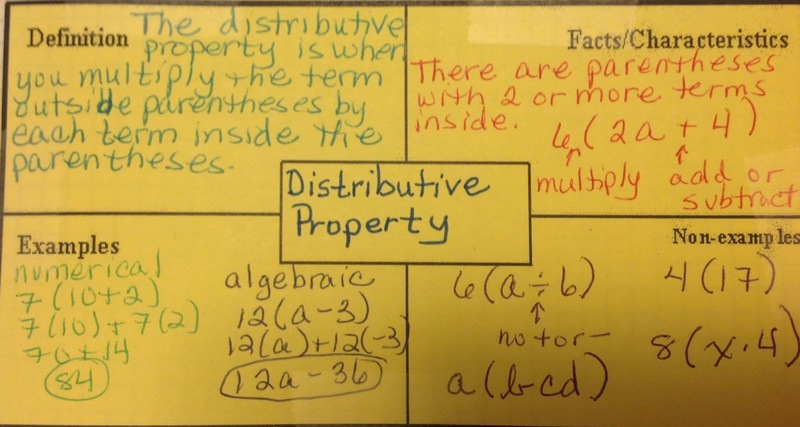 I teach 8th grade math in an urban school district outside of Chicago.